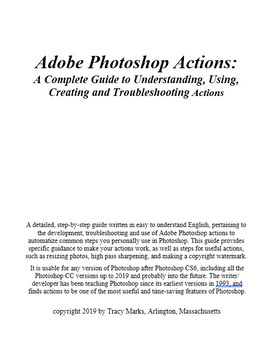 A detailed, step-by-step guide written in easy to understand English, pertaining to the development, troubleshooting and use of Adobe Photoshop actions to automatize common steps you personally use in Photoshop. This guide provides specific guidance to make your actions work, as well as steps for useful actions, such as resizing photos, high pass sharpening, and making a copyright watermark. It is usable for any version of Photoshop after Photoshop CS6, including all the Photoshop CC versions up to 2019 and probably into the future. The writer/developer has been teaching Photoshop since its earliest versions in 1993, and finds actions to be one of the most useful and time-saving features of Photoshop. NOTE: Shortcuts are given for Windows, but indicate simply the option/alt and control/command equivalents.